Syren, BlazingBarrager and XeoLee like this. XeoLee and 3 others like this. Syren, XeoLee and Supreme like this. mattotk and jaditdbz like this. Supreme and Prometheus like this. Syren and 14 others like this. Syren and 11 others like this. No, there should not be a wipe of any kind. Other (Please comment as to why). I would like to start by introducing myself. I am an avid player of DBOG, having played both retail and the resurrection of the game, with hundreds of hours on my characters. I am truly grateful that the DBOG Team has brought the game I enjoyed back in 2013 to life once more. Leading onto my topic of discussion, I will be discussing why we should have a wipe of DBOG's servers as previously done. I really hope this thread can catch the attention of the staff and that they feel free to put in any input. I don't wish to attack anybody on a personal level with this thread - my intent isn't to cause any drama, and to anyone who reads this or comments on this, I would wish for you to read the forum rules which can be found by clicking here. My goal is to advocate why and how a wipe is crucial to DBOG's survival. Once you have read the thread, here is a poll for a wipe or no wipe. Don't be ignorant - read the thread first (ITS IN TWO POSTS). - Problems with the initial wipe on March 1st, 2018. Yes, this is from the current server. And no, it is not the only example. This is an item that should not be obtainable until Level 70 is released, but as you can see in the image a player has their hands on it - because of the reason mentioned above. The item is of almost max stat, and is of a high upgrade of +13 which provides a 1000 defense bonus for both energy and defense. 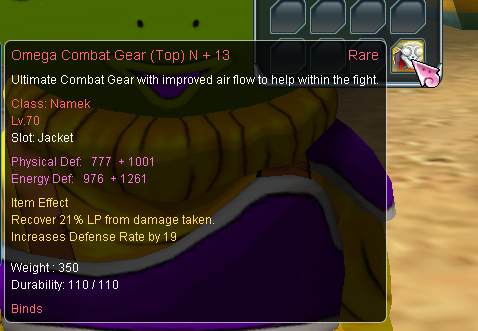 Keep in mind this is armour is for Namekians, who have won Budokai with +11 armour alone. Imagine how much of an advantage +13 would be! Stats aside, it implies that once the server implements level 70, several players who have already unfairly prepared themselves before hand have an advantage on all sort of level 70 content. With a full-set akin to that, players will be able to win Budokai, run all the BIDs with ease all because the recipes were made readily available to them on accident. This is not their fault, and because they may've invested resources such as upgrade stones and boxes into evolving this equipment it would be unfair to simply remove it from their accounts. We need a wipe to correct this unfortunate mistake, as the impact this will have on Level 70 will be devastating. Instead of trying to compensate those players if you were to remove these items, it would be much easier to provide a wipe, so everyone starts on a fair term. As aforementioned, this is not the only example. Human gear of similar stats already exist in-game, and there was a Dex Level 70 jacket being sold on the auction house months ago. Therefore, a wipe is necessary as players already have access to level 70 items. Items that are heavily upgraded and boxed too at that. Let me start by saying yes, this is indeed patched now, and has been for quite some time. 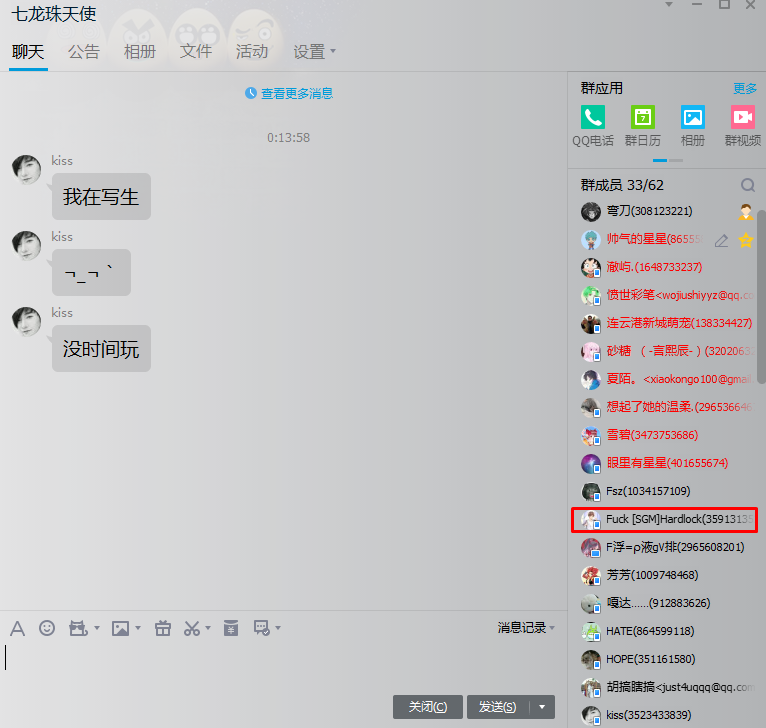 During the summer months, specifically July-August there was a popular method of cheating within the Chinese DBO community. Not to say that all Chinese players are bug abusers, but this was specifically within that group of players. The bug involved a player putting an item into a Private Shop, using their alternate account with some sort of method which would then duplicate the item they have. This essentially meant that the players could have an infinite amount of items, ranging from Dogis to CC Tickets to Stones. In the screenshot alone, that player could've made those 30 stones into 60, then into 90, then into 180 stones. And all it would take is less than 5 minutes of their time to produce what is now worth over 360kk (the hypothetical 180 stones). This is another banned player, whose name I have no use in mentioning. The thing about this player, is that thanks to that duplication bug their end-game gear was produced over night. That is how easy it is for the use of such bugs to absolutely destroy the game's worth and its economy - it is extremely unfair to all of those who have grinded for their gear, and the excessive amount of materials duplicated meant that things have/are being sold for extremely cheap. I mentioned earlier that this is a irreversible stain on the server's future. I say this, because although several perpetrators have been banned for this act; the staff team aren't super human. Although I admire the hard-work and effort the staff team go through, they cannot catch every single one of these players with the use of the current client's monitoring system. As a result of this, several people who have used the duplication bug have items stashed away on alternate accounts, using VPNs and extensive methods to cover up their trade logs. Do you really want to grind your way up to having any worth in the 70 cap, just for abusers and buggers to come along and obtain months worth of work in an instant? If we do not wipe, thousands of bugged items/accessories that have been duplicated over and over will make their mark on the 70 cap. - Selling/buying of in-game currency. - Selling/buying of in-game items using real-world currency. - Selling of in-game accounts for real-world currency. All of these are forbidden by the DBOG Game Policy. For this reason alone, the existence of these black markets are a threat to DBOG's economy and stability, and have damaged it in both the past and the present. These businessmen can simply use game-breaking methods to obtain valuables in-game, sell it for real currency and then repeat the process. They have no regard for how DBOG's economy or playerbase is affected, and as a result we have several illegitimate accounts and items that have been made widely accessible to those who can afford or will risk it. If we were to wipe, they would lose all sell-able material such as items and accounts, and because they cannot reproduce these items their trade would be destroyed. Do note that regarding this section, I cannot obtain concrete evidence myself as I am not involved in such business, so the rest is up to the DBOG Staff. 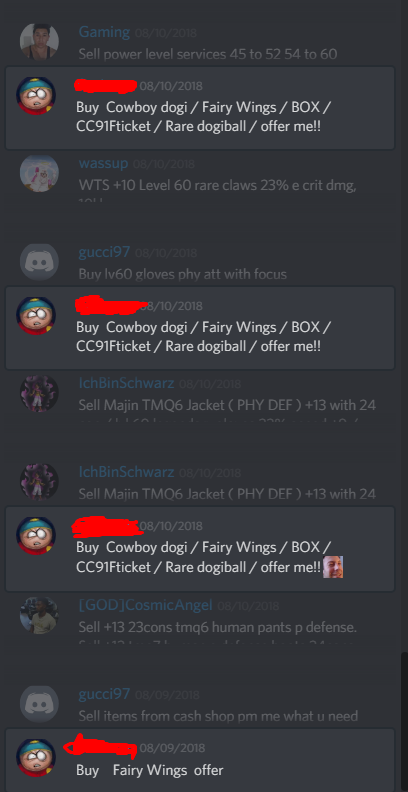 Worst of all, these illegal trades are not limited to outside applications, but can also be found in the main DBOG discord itself. This makes it evident that, once again, the stability of DBOG is threatened by such groups. I do not wish to target the following individual, so I have amateurishly edited out their username. However, it has become apparent to me that they are involved in the illegal trade within the DBOG Discord, and if staff were to go over their deleted messages it would be clear that they have said messages in the market place such as 'Selling Zeni! DM me' or something along those lines. To reiterate, a wipe is essential because of these DBO Black Markets. If we wipe, because the new client would be able to strictly monitor these players activities - and their methods of bugging have been patched, it would mean that markets such as these would be disintegrated and would no longer be able to effect DBOG. Edited 4 times, last by Supreme: Fixed up spacing, also new poll!!! ( Jan 28th 2019 ). 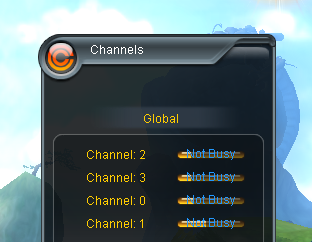 Botting is an old issue that the large majority of the player-base is familiar with. However, these bots have continued to improve upon themselves over time, and because of this it is becoming increasingly difficult to catch them and they are able to get away with their cheating much easier. When bots first appeared, they would simply kill mob after mob. Then, they began to disconnect once a player would enter a certain radius, and log back in a few minutes later. From there, they evolved to the point where they can choose different channels to log back into. Nowadays, bots can even pretend to be AFK or teleport themselves to 'safe-havens'. An example of this is the video footage of a banned bot that can be found here. This is indeed a bot, as they display the usual symptoms such instantly declining party invites and not responding to whispers. However, the problem arises in its evolution. 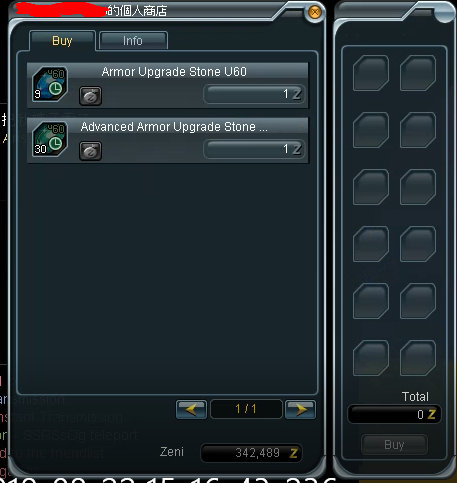 - Advanced Stones have dramatically decreased in price, being below 2kk each. This is what is primarily botted, and because of this the economy and its prices are severely damaged. A wipe is necessary, because evolving botters have damaged the economy to the point where the damage is irreversible, and prices will continue to drop until nothing as value anymore. I am not blaming these players, but they were highly suspected by the majority of the player base to have engaged in such exploits. 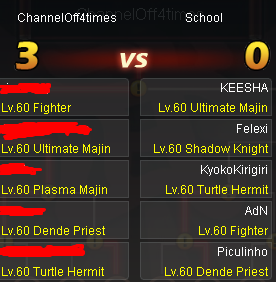 Oddly enough, the amount of times the channels went off during that Budokai was the same amount as in their party name. What is the point I am making? Such exploits have lead to advantages for certain members of the community, and as a result they have obtained things much easier and in larger numbers. For example, during this time period it was extremely easy for parties to obtain auras in Budokai - with a 50/50 chance of your opponent's team being on the wrong channel at the wrong time - and now as a result many people believe that too many people have aura and that the auras should be wiped. The exploit causing this was patched, but as a result lots of people have auras from Budokai. Auras are not the sole reward, as there are tons of Mudosa which can be used to obtain valuables in both this cap and the 70 cap. - There is a player who has four banned accounts of similar names, and currently plays on his fifth account with end-game items without any punishment. The player mentioned has engaged in all sorts of server events, such as Dojo Wars and Budokais without any sort of investigation into their account. Why are they even allowed to play, after breaking game policy time and time again through the same methods? These players are indeed on their last legs, as their methods of cheating have decreased and been patched out but their presence is still here - if we were to wipe it would give everyone a clean slate, and therefore they would be unable to cheat any further. Now that you have heard my main arguments, here are my additional points and solutions. As you know after reading this thread, the game is in a poor state. The playerbase has decreased dramatically, as made evident by the following screenshots. As you can see, there is a dramatic decrease in the number of players. 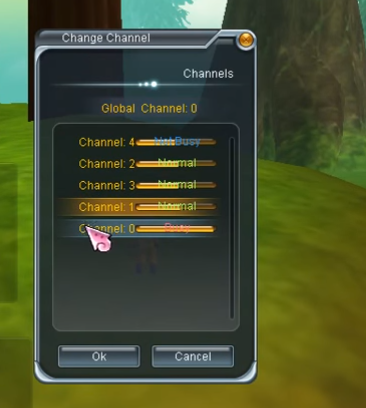 Channels are not even half full, and there are less of them at that. You may be wondering, so what do I propose to help fix the game? - Revert/Improve the cash shop. Many players issued a chargeback after PoB because of the way the cash shop has been dramatically changed. It is almost worthless now, and people cannot pull anything valuable from the wagu machine without having to wait until it reaches 100. With that said, the items pulled are not even worth any zeni because of the way the playerbase and economy has been damaged. Daneos himself said in the DBOG Discord that he will add a second wagu machine and improve upon the cash shop with the introduction of the new client, so this will give a reason for people to not feel 'scammed' as they did once before. - Unban all the banned players. As I mentioned just now, people charge-backed because they felt 'scammed' due to the cash shop being changed so dramatically. Their money spent became practically useless even if it was refunded. If we were to unban all players, it would allow for players to return and will fill up the playerbase once more. Furthermore, issues such as the duplication bug have become patched, so if a wipe were to occur and because these issues are patched it seems reasonable to allow these players to play once more, as it is almost as if they are starting afresh on a clean slate. There is no way for them to cheat or have any reason to once the server has been wiped. Now, theoretically cashers would get all their CP back. I haven't forgotten about F2P, staff can host massive CP events during the first few days or weeks of the wipe, this way F2P have a chance of getting items back too. An example of this would be an event like the one Hardlock hosted for Christmas. Because of everything I mentioned above and more. Hopefully I have made it clear to those that see no reason for a wipe - DBOG has been hurt, badly. A wipe can rectify past mistakes and provide a brighter future for the player-base. Thank you for taking your time and for your patience in reading this thread! MAKE SURE TO VOTE IN THE POLL!!!! Edited once, last by Supreme: typo lol ( Jan 29th 2019 ). I'd add the same (per class) common armor to level 60 players so they don't stay naked with the soft wipe. Also, a minimum amount of Zenis could be given too. If they’d take the time to fix the game, I and many others would take this game seriously. Just imagine how much money you’d make if you did this game right. It’s a no brainer man. I think someone must have mentioned this somewhere earlier, but how can we deal with people who don't cash and have bought cash items from others with zeni they had? If cash points will be returned to the purchasers' account, non-cashiers will have to start from nothing, in the wipe-out scenario. On top of anything, daneos officially announced that there would be no wipe-out in OB. that's a big matter of reliance and trust on the mods. I am also well aware of the problems discussed in this thread, but i am not sure if wiping out everything would be the best action we can take. Personally, I wouldn't invest my precious time into this game again if I have to do the same things from the scratch again as I can't be sure whether and when another wipe-out would come again. Wipe please, it will fix everything ! I prefer the second option but what will happen for the players who didn't pay? For real man! If I were Daneos, I would have it like a complete PoB wipe. Much easier and less hassle, but I see why people want otherwise. Like I proposed, staff could possibly host cash events for F2P like the Christmas Event of last year. Where is option: Wipe after increase game security, leave empty characters with lvl only. Also cashers will outplay f2p players at the start. I wonder how many ppl would like wipe without returning CP. i would not do that at his place. Please remember that every time daneos making Wipe he losing money because in next few months ppl wont cash, when he return CP. Edited once, last by Bad Picollo ( Jan 28th 2019 ). Thanks mate now i can really vote. I appreciate that. Voted for soft reset (delete zeni, items, etc) couse no need to delete all the data in servers. If you delete characters many ppl wonna stop playing or never come back. Deleting gear, zeni. dogis, etc is enought to improve economy in game. isnt for the names ... is for time spending to leveling 5+ characters.. you can get sames result with a soft wipe or a hard wipe.. (improve economy, delete bugged gear, etc) so why the reason to make a hard wipe? STAY TUNED FOR DRAGON BALL ONLINE GLOBAL TOURNAMENT OF POWER VERSION 2 COMING SOON WINTER 2019!